An AP and a Dual Credit student work side by side on homework during block lunch. When students go into high school looking for college credit, they usually turn to Advanced Placement (AP) classes. AP classes grant college credit to those who acquire a score of 3 or above on the AP test for the specific class. In addition, passing the class is required to receive high school credit. Unless the school the student attends offers a discount, an AP test is usually priced at $94. Although it seems like a good route for students to take, it is definitely stressful. Taking AP classes isn’t ideal as one has to pass a test to officially grant the college credit. When paying for a test priced at that high of an amount, it is a true bummer when one receives their test results back and realize a score of 2 or less was earned. When noticing failure, students will feel like taking the class was a waste of time and money. The AP score also becomes a problem when the school a student intended to go to requires a higher score than that of a 3, just beyond satisfactory. Instead of putting themselves through the stress and hard emotional nights, students should turn to Dual Credit classes. Dual Credit/Enrollment (DC) offers students to take a college course that will fit into a high school schedule. In a DC class, all one has to do is pass the class to receive college credit. There is no test needed to receive the credit. In addition, the class is correspondent to ones high school grades. Meaning, whatever grade is received in the college class is what goes on a high school transcript. Although one may argue the price for DC classes is too expensive, schools provide financial assistance to those who need it. Another way to lower costs is to apply for a scholarship with the school providing the course. Usually, the student will only have to pay for the course book if there is one needed. Even then, the book can also be found at a discounted price. A benefit that DC classes have over AP classes is that they don’t require students to attend class every day for the period it takes place in. Because the class is usually only twice a week, it makes scheduling easier as it allows them free time to do other school work. The professors will also allow students to leave early several days as college classes are typically an hour and 15 minutes whereas a typical high school class can last an hour and 30 minutes. DC classes allow students to have a true experience to feel and prepare themselves for college. Instead of a high school teacher teaching them in an AP class, students have a professor. Traditional to a real college class, students receive their syllabi at the beginning of the year and are aware of all their assignments and due dates. They’re expected to be responsible for due dates and professors rarely remind them. The class is good for practice for those who may want to learn for themselves on how to go about a college class. If students want to truly save themselves from the tough work and achieve college credit in an easier way, they should take DC. It’s a good opportunity for students to adjust to a typical college schedule while receiving credit for less work. From someone who has taken both AP and DC classes, DC is further beneficial because it is less work and gives a student of feel of what college will be like. AP has the advantage of being slightly cheaper, although there are ways to lower the cost for a DC class as previously stated. After considering the cost and benefits of both sides, DC is another considerable option. When selecting courses for high school, students have the option of selecting Advanced Placement (AP) or Dual Credit (DC) courses to have the chance to earn college credits while still in high school. AP courses are regulated by the College Board, which is also in charge of the SAT. To earn the college credit, students must take a standardized exam in May for the course they want credit for. A frequently cited drawback to taking AP courses is not every college accepts each level of achievement. However, in the state of Texas, public universities are required to award credit to AP scores of 3 or higher. Though specific score distributions vary, AP tests often provide 3’s or higher to more than half of test takers. This means college credit is frequently given to students who choose to take the AP test. AP classes allow students to take learning into their own hands by giving them a set date for the test which determines college credit. This allows students to create their own schedules and study at their own pace. Students learn important lessons of academic responsibility while taking AP classes. If the class starts in January and the students don’t study for the test until the night before, it’s their own fault if they fail. Although the workload can often feel overbearing, it helps prepare students for the rigor of college courses. The challenging coursework pushes students to work and study harder to earn the grades they want. Students are encouraged to form their own study habits and become independent learners through studying for their AP tests. Would you prefer to take AP or DC? A benefit of taking AP courses is the lower cost level; they are far cheaper than both college courses and DC classes. Students don’t have to pay for the class itself, like in DC; they only pay to take the test if they choose to do so. Depending on whether or not a student is on free/reduced lunch, an AP test can either cost around $94 or $9. DC courses often cost hundreds of dollars, not including having to pay for the textbooks. When taken during the school day, AP classes meet each day during its class period. DC classes only meet twice a week, giving less time for students to interact with and learn from their teachers. Having five class periods a week allows for students to learn at an accelerated pace and prepare for their exams, as well as receiving one-on-one interactions with their teachers. AP classes receive a 1.3 GPA weight in Skyward. DC classes, however, receive a 1.2 GPA weight. The GPA weight makes it easier for students to improve their class ranks through taking AP courses. Additionally, if a student takes the AP exam and has a grade higher than an 85 in the class, they can be exempt from the final for that class, regardless of their graduating class. This alleviates the stress of cramming the night before finals and allows students to relax after their exams are taken. Ultimately, the decision to take DC or AP courses depends on what is ideal for each individual student. DC courses offer a flexible schedule and don’t require a standardized test to receive credit, but they also can be expensive and take up extra spots in students’ schedules. 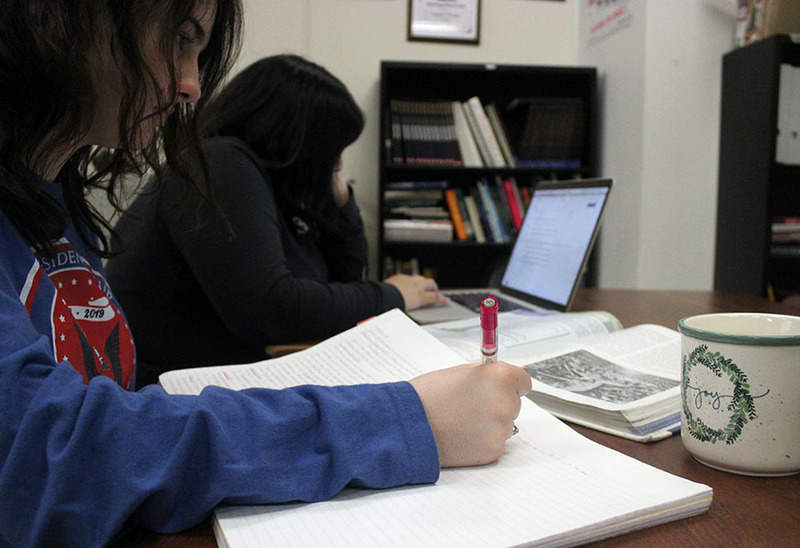 AP courses provide a hefty workload, but the tests are cheaper and the program offers a way for students to become independent learners and be better prepared for college.